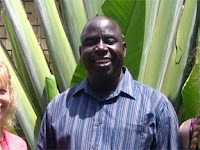 Mboi Andre (pictured), who is president of the union of Grace Brethren churches (approximately 2,500 churches) in the Central African Republic, is in the US to have reparative surgery on his hand. Here is the latest update from Grace Brethren International Missions–please pray for the surgeons, for Mboi, and for all who are involved. All pre-op testing went well. The lady who checked him in at the hospital was a converted African Muslim! The technician who drew his blood for testing was a former US soldier who had served in Chad who was amazed to connect with someone here in the US that was actually aware of the country of Chad and knew so much about Chad and the CAR! After his initial examination of Mboi’s wrist, the doctor is optimistic that he can help Mboi with this surgery. The plan is to fuse his wrist, do a bone graft with some of Mboi’s own bone as well as some artificial bone material and also do a major tendon release. This will be a major surgery and Mboi will have much pain afterward. He will need a minimum of two weeks of intense post-op therapy. The surgery is scheduled for this Wednesday morning at 7:30 AM. Please uphold Mboi and the doctors who are making this possible in your prayers over the next several days.